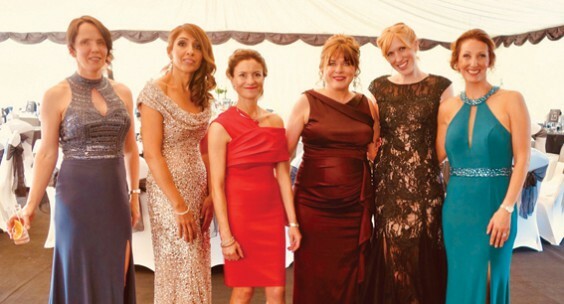 A Masquerade Ball held in Barnt Green raised more than £20,000, to be shared between St Andrew’s CofE First School and Barnt Green Sports Club – with the final total announced in pictures by the Ball Committee’s children. The annual event, held at the Sports Club, featured a live auction with prizes including signed sports paraphernalia, a “signed by the PM” bottle of champagne and a glamping holiday. There was also a silent auction, which included a four-ball at Blackwell Golf Course, a dining experience at the Vic, Jaguar/Land Rover off-road experience, tennis coaching, music lessons, signed football shirts and many more. The 318 guests enjoyed a three-course meal, live music from 2 Weeks’ Notice, and a silent disco. Paul Phillips of Seamless Chauffeurs provided a free shuttle service to take guests home at the end of the evening. Any donations for this service went to the Fiona Edwards Scanner appeal at Birmingham Children’s Hospital. Committee members Janette Day, Ragan Mathews, Kiran Kularia, Sarah Adcock, Denise Carter and Lucy Challinor would like to thank all sponsors, people and companies who donated prizes to the auction and raffle.